Press the dough into the pan. Add sauce, cheese, and pepperoni. Bake 15 - 20 minutes. 102 Comments on "Pepperoni Pizza"
I’ve gone through the FAQ’s, but I can’t find the answer I’m looking for. I would really like to make this thin crust pizza dough. Problem is; I’m diabetic, and white flour of any sort and I don’t get along too well. Could I substitute the bread flour you use for whole wheat pastry flour? If so, what do I need to do to prevent myself from making a thin crust brick; perfect for cleaning and then removing the enamel off of one’s teeth. As well, since I’ve never seen turkey pepperoni here in Ottawa, would it be a good substitute to make use chicken or turkey bacon? That I can find in abundance. BTW, Thank you for not forgetting the hero’s here up in Canada. From one former Londoner to another, I felt a lot of pride reading what you do to help these Ontario firefighting warriors. I was making a starter dough to make bread, tomorrow, when inspiration struck. Jenny’s Pepperoni Pizza for lunch! Rather than buy the 14 inch pizza pan with the perforated bottom, I used my old standby, a cheap, 12 inch, aluminum pizza pan I purchased in the utensils section of a grocery store years ago, and Jenny’s recipe. I made some small changes to the recipe. For example, I let the dough rest for about 20 mins, (rather than 10 mins) before rolling it out. After the pizza toppings were added, I again let the pizza rest for about 10-15 mins. before popping it into the oven. This let the dough rise a bit, so the crust is lighter. Since my pan was only 12 inches, the extra dough was used to make a thicker crust at the edge of the pizza, and I knew it would swell up a bit when baked, like a breadstick. So, after baking the pizza for about 14 mins, I pulled it out of the oven, brushed the crust with garlic butter, sprinkled on some parmesan cheese, and popped it back in the oven for 2 mins. The result, a gorgeous pizza with a bread stick crust. When the pizza was cut, you could see that the bottom of the pizza was perfectly brown. Not too light, not too dark, having been baked at 425 about 4-5 inches from the bottom of my oven. Since I made a salad to accompany, I put veggies on my pizza, too. Even so, the crust did not sag when you held a slice. Great crust! So if you don’t have the perfect pizza pan, I encourage you to try the recipe, anyway, as it still makes a fabulous pizza that looks like it came from a top notch pizzaria. Make this for dinner tonight. My husband’s response “this is great, please remember the recipe so you can make it again!” I loved it too! Thanks Jenny! Hi Jenny if can I use a regular cookie sheet/baking tray if I don’t have a pic’s pan? Also, what can I substitute with if I don’t have pizza sauce? Thanks! You can make a free form pizza on any kind of baking sheet, meaning just make it flat into any shape you like, even square or irregular. You can make pizza using barbeque sauce (see my recipe) or look up other pizza recipes on the web. Same thing happened to me. I put it in the fridge overnight and took it out two hours before dinner. It was much better to handle even tho I did have one hole bit I was able to patch it up. I stretched it nicely with my hands on a floured cutting board. It’s in the oven right now! I tried you pizza and it was amazing thank you! My 4 sisters and i loved it. I put hot peppers, olives, and pepperoni, on mine. However i used a 12 inch pan so my crust wasn’t crisp as i woulve liked it. I like my crust very thin and crisps. I tried tweaking the recipe but no luck. Should i increase the temperature of my oven? it didn’t take long to heat up. I also used all purposes flour and Flieschman’s pizza crust yeast. Aslo i tried to used the microwave technic for the vegetables that i used and it didn’t work.Any suggestions? It sounds like your oven was not hot enough. I takes quite a while for ovens to get that hot so I suggest using an oven thermometer to be sure. My oven takes 30 minutes to reach 425. OMG!!! made your pizza tonite,absolutely fabulous,did pepperoni,mushrooms and green peppers/onions,got the WHoley pizza pan as you suggested,sorry we didnt make 2 pies. Great!! My fresh mozzarella would not shred. It just clumped up. Any suggestions? I don’t use fresh mozzarella but I believe it should be sliced and not shredded. Jenny, the pizza receipe was amazingly delicious! We LOVED it. So very easy to make. We’re about to make it again tonight. This has been my go-to pizza dough recipe for 3 years, and it never fails. Do you know how long I’ve been looking for a decent home cooked pizza recipe? This was perfect! I was wondering if you would have a recipe for chicken bacon ranch pizza ( my favorite!!!). I’ve tried some but just can’t get it right. Thanks!!! Did you use the pan with the holes? Did you change the recipe in any way? How long did you preheat your oven? I used the pan with the holes and followed the recipe to a T. My oven was heated to 425 in 15 minutes. The crust was yummy though. Maybe I should increase the amount of oil on the pan? Thank you for replying so promptly. I appreciate any help from you so I can slide the pizza off the pan like you did. I agree that you could try a little more oil on the pan and also use an oven thermometer if you have one. My oven will never reach 425 in 15 minutes. If the oven is not hot enough, the pizza could stick. Could you put the dough on parchment paper on the pan? I have used parchment paper under loaves baked on a stone with good results. You can but if you use a pan with holes, you will block the holes and also the oil will not touch the crust and both of those things are what makes it crispy. I also make pizza using parchment paper but only when I use a pizza stone. I have tried your breads and loved it. Just one question for this pizza. I don’t have bread flour, so can i use all purpose flour instead for this pizza dough and only fot active dry yeast. How much of it do i need for this recipe. Thanks much for all your recipe. GOD bless. Yes, you can use all purpose flour and dry active yeast for this recipe. The ingredients would not change but the temperature of the water should be reduced to 110 degrees F.
Hi Jenny, I used to watch your talk show! And I loved it! My daughter sent me the link to your crispy pizza recipe and I will try it next week. In the mean time, my daughter has already made your pizza recipe at least 2 times this week and she raved about it! Your other recipes look very inviting too. Thank you for taking the time to write up the recipes. You look so pretty in the video too! Can’t wait to try this, but first I need to buy a pizza pan with holes like you are using and I am a bit confused by your written recipe. It says it makes one 12-inch pizza but in the body of the instructions you say to use a 14 inch pizza pan. On the video you are pressing the dough out to the very edges of the pan. What do I need, a 12-inch pizza pan or a 14 incher? That was a typo! I don’t know how I missed that but I fixed it, thanks to you. This recipe makes one 14-inch pizza so you’ll need a 14-inch pan. Thanks for bringing this to my attention and good luck with your pizza! Made this pepperoni pizza for dinner tonight. I don’t usually write reviews but this recipe is fantastic! I did it by hand since I don’t have a heavy duty mixer just kneaded it for the 3 minutes. The crust was light & crispy. I also put the pepperoni in the microwave to degrease it somewhat. My husband and I ate the whole thing in about 10 minutes! This pizza is dangerously good! Glad we worked out today! 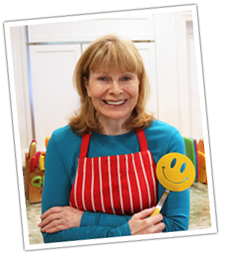 Thank you Jenny…I am excited to try some of your other recipes. Love the videos! You leave it on the counter until it’s at room temperature and I think that would take at minimum an hour, maybe a little longer. Two hours would do it for sure. For a crispy crust you want as much heat as possible under the pan, so the closer to the flame the better. I’m not sure but I would try heating the pepperoni on a baking sheet and when it’s warm, blot it with paper towels top remove the grease. You might also be able to cook it in a pan and then do the paper towels. I believe it’s heat that releases some of the grease. But try this with just a couple of slices first! I don’t know what I did wrong but my pizza base wasn’t very nice. Very dry, I didn’t have bread flour so just used all purpose. Maybe I didn’t put quite enough liquid in? I only say that because my kitchen didn’t handle it well at all and I’ve got the heavy duty one. I was so disappointed. I will try again and see what happens. Thanks for all your great recipes. I made this pizza for my family tonight and they loved it. It had all the flavor without the grease. I did everything by hand because my mixer is not very good and when I went to knead the dough it was very, very sticky and hard to handle. Any suggestions? Thanks! You can always add more flour to a sticky dough, but a little at a time and only enough so you can knead it. You could also try using a scraper. Made this doubling the recipe for the crust and it turned out fabulous. Used a deep dish pizza crust pan. Also tried your Deep Dish Pizza and it was also delish. Much better than ordering pizza from a restaurant! Thank you. I tried your microwaved pepperoni trick a few times while depleting stocks of pre-sliced pepperoni. Before using up the last of the sliced pepperoni, I bought a Gallo brand pepperoni stick. I found that the ‘slice your own’ pepperoni stick was nowhere near as oily without the need to nuke it, even after doing the microwave trick to degrease the store bought sliced pepperoni. So far I have not had to degrease the slice your own pepperoni and have even tried Hormel’s pepperoni sticks with similar less oily results. Just as a side note: Gallo brand stick pepperoni is a bit spicy with a little bite to it, the Hormel brand on the other hand is mild like the pre-sliced. Can I use the same making way for the bbq chicken pizza? Yes, I switch around between both methods for all my pizzas. Why is my pizza the side is harden and the below of the pizza is soft? Is that any reasons? And under the pizza looks uncooked and not brown. It sounds like your oven was not hot enough. And did you place the oven rack at the bottom? Give me a little more information so I can help you more. What kind of oven, what kind of flour & type of yeast, how long did you preheat the oven, how long did you bake it? What size pan? Tell me as much as you can. Can the pizza dough rest for more than a hour? Like about 2 and half hour. Is the dough will be alright? I think anything over an hour at room temperature might cause the dough to expand too much. If it’s in a bowl it could spill over. For more than an hour it’s best to refrigerate it, which you can do for several days. And refrigerating pizza dough actually improves the flavor and texture. This is the best pizza recipe I’ve ever seen on an american channel on YouTube. And I’m italian. Hi Jenny 🙂 Thank you so much for sharing this recepie. The pizza is so amazing, amazing taste. My family loved the pizza, so was I.
I made this the other day and even though I did not have a 14″ pizza pan with holes, and only a 12 pizza pan without holes, it still came out good. I’m looking forward to adding different spices to my sauce that I made as well as trying wiping the crust with a garlic and butter sauce, (trans fat free that is), before I put the pizza sauce on next time. Will it matter if I use a 1 inch round pizza pan with no holes to make this dish? You will get a pizza but it probably won’t be crisp like mine. Hi Jenny. I love your pizza recipe. I made one with low fat turkey pepperoni. I also added some mushrooms, onion and garlic which I saute first and removed moisture and it turned out perfect. It was the best pizza I have ever had. Light, crispy and so delicious.I’m wondering whether you plan some recipe for some healthy garlic pizza with spinach for example. What do you think? Thanks again for sharing your recipes. I have made your Deep Dish skillet pizza several times and tried the thin crust recipe on the weekend. It came out perfect and was so easy to make. The dough was so easy to prepare; the hardest part was preparing the toppings. I don’t like meat toppings so I just used peppers, mushrooms, red onions and canned baby shrimp on mine with 1/4 cup mozzarella. Everyone loved it. I love the recipe Jenny. Thank you for sharing. God bless. I made this pizza exactly like you did and it was incredible thank you ! ENJOYED MAKING THIS PIZZA! THANKS IM PLANNING A PIZZA COCKTAIL PARTY. THANKS FOR THIS GREAT DISH. I’ve never had much luck with the kneading paddle. My dough always wants to rise up the paddle so I usually knead larger doughs by hand, but the regular paddle seems to do the job with a small dough like this. I’ve never had good luck with homemade pizza but this recipe has turned out perfect both times I’ve made it. My kids love it…even my picky eater! We will be making this a lot! I just tried this recipe out on my teenage son. Pickiest pepperoni pizza eater ever. Besides this being the easiest pizza dough ever, it was a hit! I made the pizza exactly as you said and it turned out amazing! Super crunchy and no grease. Great tip on degreasing the toppings that go on homemade pizza. Had pizza without geasy fingers. You can also stretch the dough by placing it on a upside down mixing bowl. Found that tip on the Internet. Will this recipe work with a 16 inch pan? Or do you have a recommendation for how to scale it? Thanks. If you like a super thin crust, you could probably stretch the dough into a 16-inch pan. If not, I would try increasing the flour to 2 cups and also increasing the other ingredients by 1/3. Thank you! Those adjustments worked okay. It made it very elastic and difficult to stretch…still tasted great though. I also made the stated recipe as you wrote it and I found it easier to stretch the dough over the 16 inch pan. Tasted equally as good. Thanks for the suggestion. Ms.jenny your pizza looks the bomb. 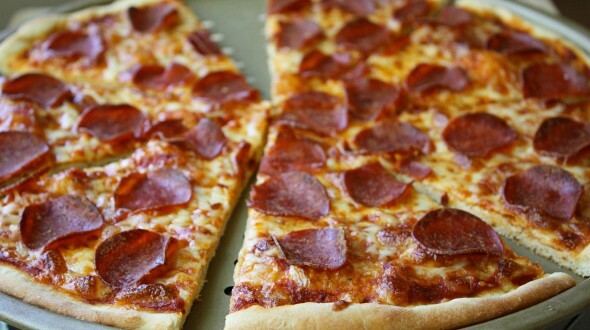 My mouth is desperate for that delicious pepperoni pizza. Thank you for this recipe. Came home from watching Liam Neeson’s “Non-stop” movie and made this. Just finished eating this for a very late after-movie-dinner. Between me and my son there’s only one left. It’s so good and refreshing. It doesn’t have that restaurant-pizza taste. Will make it again of course :). Hi Jenny, i just want to say that you’re the reason i’m going to start cooking because you made it look so easy & yet delicious. i just have one question, this recipe is enough for how many people ?? if you please reply to me ASAP because i’m planing to cook it within this week. It makes me feel so good to know that I motivated you to start cooking. I would say the pepperoni pizza serves three. I cut it into 8 pieces and there are two of us here. We usually have two pieces each, but sometimes three (we have a salad first so that fills us up some first). So if you have a big salad or soup first, you might serve four but if you have two really big eaters, they could probably eat all of it on one sitting. But the average at my house is three servings. I have a question, if i just wanna make half pizza, can i freeze the other half of the dough? And do i have to freeze it after the rise? You can definitely freeze pizza dough and do it before the rise. Just shape it into a ball (I would rub it lightly with oil) and freeze in an air-tight freezer bag. Make sure all the air is squeezed out. Then when you need it, let it thaw in the fridge overnight. The next day, bring it to room temperature and proceed with your pizza recipe as usual. what do u mean by an air tight freezer bag? can i just wrap it in plastic wrap in freeze it? Plastic wrap like Saran Wrap or Cling Wrap are too thin for the freezer and I think you would need a thicker freezer bag, like a Glad freezer bag with a zip lock to get a tight seal that will remove all the air. You can wrap it in plastic wrap first but I would then put it into a zip lock freezer bag and get all the air out. I hope I’m making sense. Okay, thanks for taking the time to answer this! I’ll be making some more of this amazing dough tomorrow and store half of it. Hi Jenny. Just want to ask where did you buy your pizza pan. I cant find that kind of pizza pan in Sarawak Malaysia here 🙁 if i use a regular pizza pan,will it be crispy too? i am so scared that the pizza will not turn out to what i’ve expected. thanks for your time. I looked online for where to buy a “pizza crisper” in Salawak and found this (http://www.rakuten.com.my/shop/bigspoon/product/502107782_84/). I bought mine at Williams Sonoma, which is a kitchen/cooking shop but I see them at department stores and discount stores like Target. You could also try any kitchen supply store, department store, or even a restaurant supply might have one. Mine is online at Williams Sonoma (http://www.williams-sonoma.com/products/goldtouch-nonstick-pizza-crisper) and they have one at Bed, Bath & Beyond (http://www.bedbathandbeyond.com/store/product/Breville-reg-13-Inch-Non-Stick-Pizza-Crisper/1016849944?Keyword=pizza+crisper). Let me know if you find one. As you mentioned in your video that let the dough rest for 1 hour instead of 10 minutes as per your written recipe. May I know which one should I follow? Can I make the dough one day in advance? If yes, how should I keep it? I’m so glad you mentioned this. After making the video I found that the correct temperature for the yeast should be 120 degrees and that a 1-hour rise is not necessary – only a 10-minute rest. I changed my printable recipe but was not able to make any changes/edits to the video at the time. Youtube now lets you insert a pop-up box with notations which I am doing today. So thank you for this question. And as for making the dough in advance… yes! It actually improves the dough and is considered a “secret” to the best pizza dough. Just cover the dough with plastic and instead of resting it, put it in the fridge for up to 2 weeks!! I made this recipe last night and it turned out amazing! Thank you for all your wonderful recipes. Any ideas for a cheesecake recipe? You’re the best!! Made this and it turned out amazing! Crispy crust as promised. Thank you so much! I love you for showing how to de-grease the pep!! 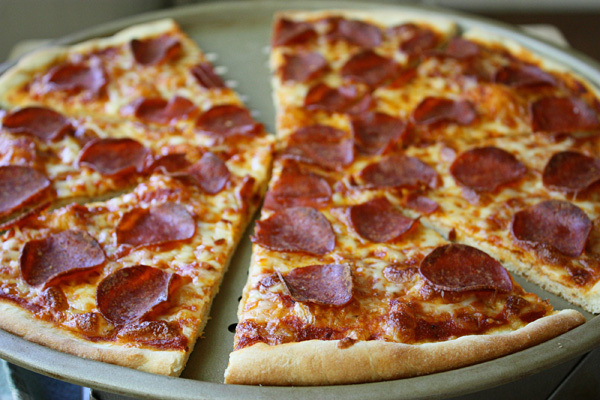 Jenny, I love this pizza… It is so good. Thank you so much for all that you do in sharing these wonderful recipes with us. God bless. I made this and seriously this is amazing ! Like you said you don’t no! awesome pizza. made it last night for my family. My 10 year old made 6 pizzas and they tasted great! thanks! I didn’t realize how easy it was. My family loves your pizza. I used these tips and got my best pizza crust ever, and nice idea for the pepperoni in the microwave.